Intended for use against retail stores, this complaint letter takes umbrage with a company not holding a requested item. 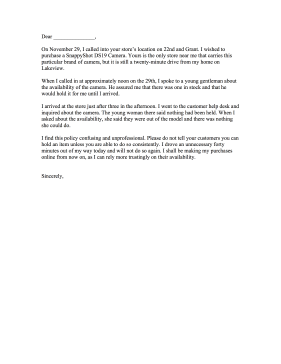 On November 29, I called into your store's location on 22nd and Grant. I wished to purchase a SnappyShot DS19 Camera. Yours is the only store near me that carries this particular brand of camera, but it is still a twenty-minute drive from my home on Lakeview. When I called in at approximately noon on the 29th, I spoke to a young gentleman about the availability of the camera. He assured me that there was one in stock and that he would hold it for me until I arrived. I arrived at the store just after three in the afternoon. I went to the customer help desk and inquired about the camera. The young woman there said nothing had been held. When I asked about the availability, she said they were out of the model and there was nothing she could do. I find this policy confusing and unprofessional. Please do not tell your customers you can hold an item unless you are able to do so consistently. I drove an unnecessary forty minutes out of my way today and will not do so again. I shall be making my purchases online from now on, as I can rely more trustingly on their availability.